Who says pizza has no place in a healthy diet? Give into your pizza cravings with my eggplant pizza solution. This recipe is worth the wait. It makes an amazing side, snack or main course. Dig in and experience the power of pizza at 56 calories a â€œsliceâ€! -Put the eggplant pieces on a double layer of paper towels and sprinkle both sides generously with salt. -Let the eggplant sit with the salt on it for about 30 minutes to draw out the liquid. -Make the sauce by heating 2 teaspoons olive oil and sauteing the chopped garlic just until it becomes fragrant not brown. -Spray a roasting sheet with non-stick spray, lay eggplant slices on, brush the tops of the eggplant with the olive oil, and sprinkle with dried Italian seasoning. -While the eggplant roasts, slice the fresh basil leaves, plum tomatoes and combine the grated Parmesan and shredded mozzarella. -After 25 minutes remove eggplant from the oven and turn oven setting to broil. 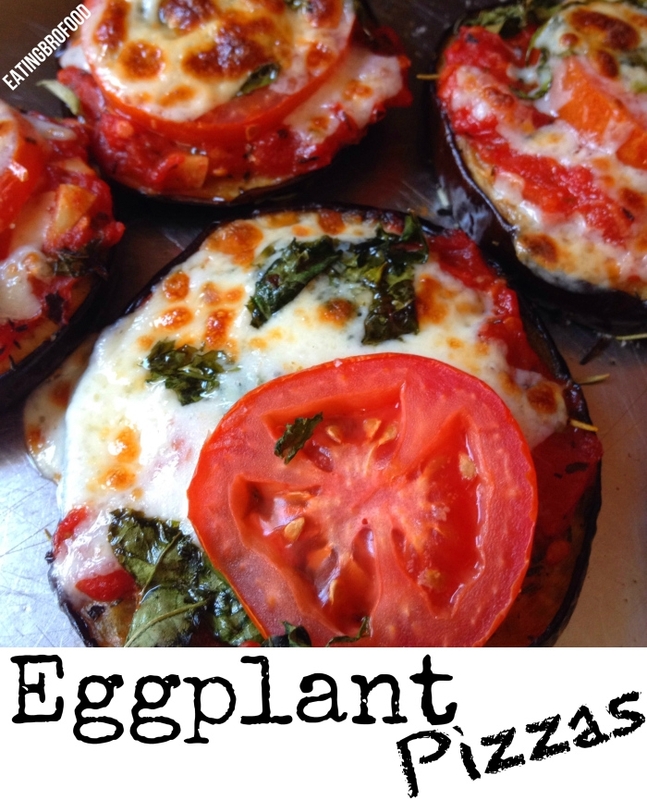 -Spread a few tablespoons of sauce on the top of each eggplant slice, sprinkle with basil, fresh tomatoes and top with a generous amount of cheese. -Put pizzas under the broiler for 6 minutes until the cheese is melted and slightly browned.